De Lorenzo professional salon colours and home colour maintenance ranges are developed using natural botanical extracts, UV inhibitors and designed to provide superior shine, longevity. De Lorenzo Novacolor Professional salon colours are the only professional colour products made in Australia specifically for our climate. 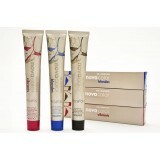 De Lorenzo professional salon colours and home colour maintenance ranges are developed..